The challenging times taught Paul Dawbarn not to take no for an answer and now his hunger to succeed is driving a restaurant business appropriately named the Hungry Monk. Paul opened the family-owned and run Hungry Monk on the site of an old restaurant in the centre of Southport which had been closed for four years. “Somebody told me I was a good cook. I have set up a couple of businesses for people which have been a success and decided to have a go myself.” Paul, with a background in post offices and a greetings cards business, had been through challenging times. “I have been there, made it and lost it,” and saw the opportunity of serving up a menu of good food and free entertainment as his “last chance”. The Hungry Monk was decorated on a shoestring because of the need to keep costs down with furniture and artefacts bought from eBay to create a shabby chic environment and trendy cafe atmosphere. But Paul needed hard cash to get the business off the ground and turning to traditional funders was not an option owing to his low credit rating at the time. Despite repeatedly being told he “couldn’t do it”, Paul knew his pension, and ultimately pensionledfunding.com, could help. His business plan was studied and independently valued before Paul utilised £30,000 from the pension pot he had managed to hang onto. 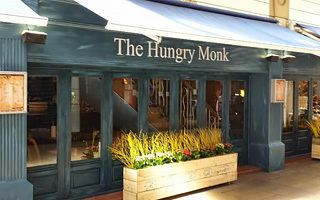 After just over a year in business the Hungry Monk is doubling its forecasts. Paul now employs 25 people and his restaurant is open seven days a week. Breakfast, lunch and dinner is served as the business caters for a huge variety of tastes with hearty breakfasts and a grazing menu, similar to tapas with a modern British twist, and a signature dish of a huge 28-day matured Inka Charcoal cooked steak pulling in the punters. With a shopping centre nearby he has a thriving day and evening trade. “We serve anything from a T-bone steak to a tea cake,” he said. Paul is eager to build on the success of the live music and entertainment nights he launched which are fully booked at least two weeks in advance. Two to three nights a week the Hungry Monk is packed as diners are treated to free entertainment featuring anything from music, comedy, race nights and tribute acts. With a taste of success returning, Paul’s fortunes have turned full circle. “Now I’m adding to my pension pot, not taking out. I’m putting in a weekly contribution and my pension pot is growing,” he said.